James Alfred Cooper, 95, was born February 3, 1923 in Natchez, Mississippi to Charles and Ruth (Starnes) Cooper and peacefully passed away Friday, January 29, 2019 in Tahlequah, Oklahoma. He proudly joined the United States Navy during WWII and served on the 3rd Fleet of the USS Orvetta. Before deployment he married the love of his life Dimie Cooper in Los Angeles, California. After the war James and Dimie moved to Muskogee, OK and started his career at Owens Brockway Glass and held the position of Foreman on the hot end for over 30 years. He retired in 1988. James loved music and spent his time playing his guitar with family and friends. 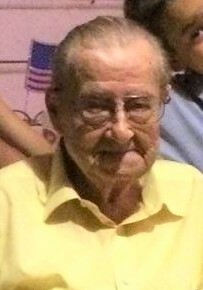 James was a faithful member of the Valley View Church in Fort Gibson where he was a charter member. James was preceded in death by his parents; wife, Dimie Cooper; daughter, Orvetta Cooper; and granddaughter, Orlando Cooper. He is survived by his grandson; Jackie McBroom of Great Falls, Montana and his wife Cary; great grandchildren; Anabelle McBroom, Jayme McBroom of Great Falls, Montana, Jacqueline McBroom, Trey Stach of Fort Gibson, OK; nieces; Lynn Etheridge of Texas, Phyllis Lolewelyn of Mississippi, Barbara Hill, Carla Farley, Cortney Fills, Autumn Farley, Myan Farley, Sharon Kay Cleaton all of Oklahoma; great nieces; Toni Metzner, Angie Fuller from Oklahoma; great nephews, Barry Moon of Fort Gibson, Carl Drake and Brian Fuller of Oklahoma and many more nieces, nephews from all over the country and many friends. A service celebrating James’ life will be 10:00AM Saturday, February 16, 2019 at the Valley View Church in Fort Gibson with Reverend Don Rhyne officiating. Committal prayers and interment will follow in the Park Hill Cemetery in Park Hill, OK with Jackie McBroom, Barry Moon, Trey Stach and Carl Drake serving as casket bearers. The family of James Alfred Cooper has entrusted his care, services and burial to Clifford D. Garrett Family Funeral Home, Fort Gibson, OK. 918-478-2555.